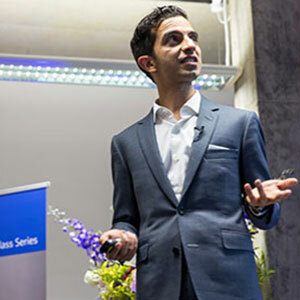 Founder and CEO of The Business of Fashion (BoF) blog and GCU Honorary Professor Imran Amed delivered an inaugural professorial masterclass at GCU London. In his lecture ‘A Series of Digital Experiments’, Professor Amed discussed the lessons he has learned since launching BoF in 2007 and explored the impact of technology and the rise of social media. Professor Amed was introduced by GCU Principal and Vice-Chancellor Professor Pamela Gillies CBE, who welcomed him to the campus in London’s Spitalfields. His lecture was followed by a Q&A, led by Professor Christopher Moore, Assistant Vice-Principal and Director of the British School of Fashion. Those in attendance included GCU Honorary Professors Caroline Rush, Chief Executive of the British Fashion Council; Henry Holland, fashion designer; Hannah Coffin, CEO of Needle & Thread Ltd; and GCU Honorary Graduate Tessa Hartmann, fashion publicist, broadcast commentator, and Founder and Chair of the Scottish Fashion Awards. BoF was launched just as social media and smartphones were about to explode onto the scene, new markets were rapidly emerging in China, India and Brazil, and the financial crisis threw the industry into a tailspin. Eight years on, with its award-winning editorial franchises and a global reputation for intelligent, analytical content, BoF has grown into the pre-eminent daily destination for the global fashion community. Professor Amed has been named in Fast Company’s 100 Most Creative People in Business, British GQ’s 100 Most Influential Men in Britain, Indian GQ’s 50 Most Influential Global Indians, British Vogue’s 25 New Fashion Faces to Watch, and Wired UK’s 100 most influential figures in Britain’s digital economy. Previously, he was a management consultant at McKinsey & Co. Professor Amed has an MBA from Harvard Business School and a B.Com from McGill University. Find out more on how the evening unfolded across social media on Storify.